Engine Misfiring or Running Poorly?--Precision Auto Inc. Your vehicle’s ignition system is the part that allows the engine to come to life when you turn the key. The spark plug is the part that causes a spark to ignite the air-fuel mixture in the cylinders. This makes sure your vehicle is revved up and ready to go. Over time, the spark plug will need to be replaced because they wear down. This makes it much harder for the air-fuel mixture to ignite and will cause the engine to misfire. Depending on your vehicle’s make, model, and size you will have a number of spark plugs that coincide with the number of cylinders. The car may still ignite after a spark plug is worn down, but its performance will be severely compromised. Precision Auto in Germantown, MD has experience performing spark plug replacements for a variety of vehicles and know how to handle labor-intensive spark plug replacement services. Our customers trust their spark plug replacement services to us because we make the entire replacement process much easier. We provide spark plug replacements that are thorough, complete, and correct. There are numerous ratings for spark plugs and our specialists will make sure your vehicle is using the right rating. Our specialists provide excellent check-ups and routine maintenance that ensures that your ignition system is up to par. 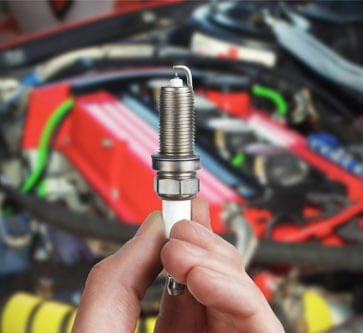 Spark plug replacements are a good idea any time you replace a component in the ignition system. The team at Precision Auto is here to keep you two steps ahead of any engine misfire or malfunction. It’s better to let us stay on top of your engine’s peak performance than to wait until your vehicle is sidelined by a breakdown. Pay attention to all of the warning signs that your engine gives–check engine light, misfires, engine vibration–if you need to replace the spark plugs. We’ll handle the rest for your return to exceptional performance. Schedule Your Spark Plug Replacements Today! Today’s the day to enhance your vehicle’s overall performance. Spark plugs are a key component to your vehicle’s ignition system, and our specialists provide the spark plug services you need. The spark plug will wear down eventually and compromise the engine’s performance. Let the team at Precision Auto handle your vehicle’s inspection and diagnosis of the ignition system. If spark plug replacements are necessary, you’ll have a quick and complete service experience at our shop. Give us a call today at 301-428-3447 to schedule your next spark plug replacement service. You can save time right now by using our convenient online scheduling system. Next time you’re in the area–12811 Middlebrook Road–feel free to stop by with any questions or concerns. We gladly accept all of our walk-in customers.